But worth incalculably more if they were of a chief’s family; with slaves of their own, land, and rights. 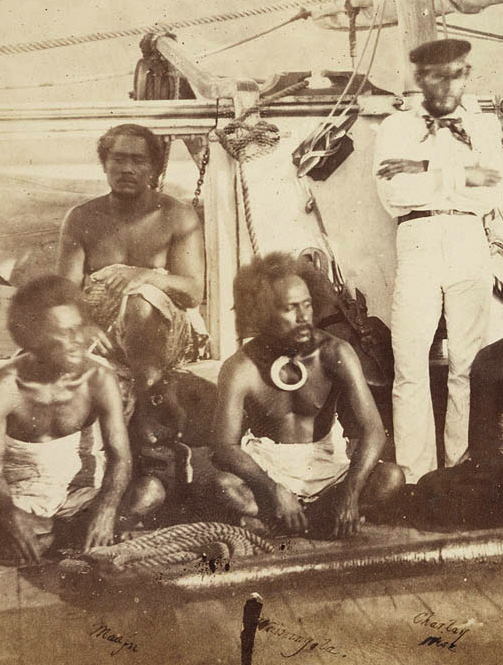 “White murders were generally caused by unpaid “theft” of Islander women, by White men reported British Naval Commander Acland in 1885 “had long discussions with everybody in the group employing native labour… finding it “extremely difficult to obtain truthful information, owing to the fact that there is a constant triangular duel being fought between the traders, labour collectors and missionaries and all of them are inclined to circulate reports against each other”. In general, Acland confined his observations to the labour trade of Queensland and Fji, believing that they were usually well looked afgter but that the Queensland climate was and its hard work was too much for the islanders.. He told of the degraded live lead by most indigenous women and the decreasing population of the group. “Women are looked on as so much property, and if they go away without their owner’s consent he is determined to be avenged upon someone. They do most of the work and become the property of some man from an early age. The value varies from ten to forty pigs in different islands, and in ratio to the charms and merits”. Acland like many observers before him, concluded that the principle cause of White murders was the stealing of Islanders, particularly of women. By stealing he did not mean kidnapping. He meant the new “owners” had not been properly paid for them. “Our notion on this subjects are that such a transaction would be a species of slave-buying…but the natives look upon the bargain as something quite different; they expect a present for each man (or woman) that goes and are disgusted if they do not get it”.